The New York Times is getting into food delivery. It's partnering with a startup called Chef'd to deliver meal kits to accompany recipes from NYT Cooking site. The news -- first reported Thursday by Bloomberg -- comes as the New York Times looks to offset declining revenue in its print business. The New York Times confirmed to CNNMoney that it would be providing the recipes, and Chef'd will take care of ingredients, delivery and logistics. 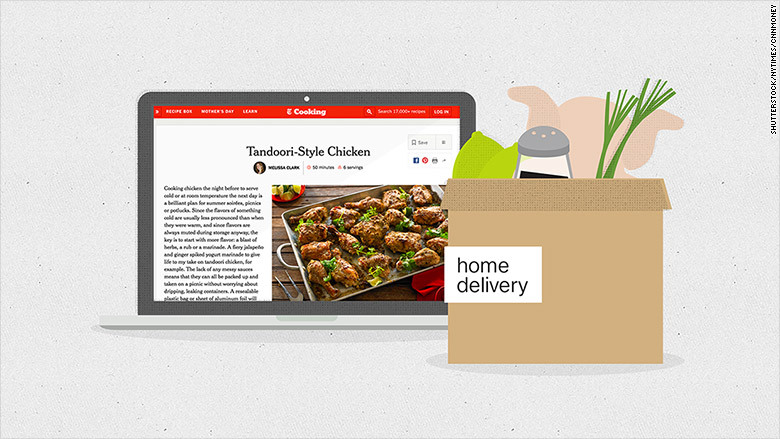 Chef'd -- which delivers pre-portioned ingredients for recipes -- is just one year old. It raised more than $50,000 in 2015 on Indiegogo, and also raised $5.25 million from its founder Kyle Ransford and Chris Growney, a board member at the startup. The startup, which is based in El Segundo, California, has two distribution centers where it prepares meal kits. Ransford said it delivers hundreds of thousands of meal kits every month. Chef'd sources food directly from food manufacturers and distributors, as well as directly from farms. It takes one to two days to deliver to customers depending on where they live. Meals run from $19 to $79 depending on whether they're for two or four people and what the ingredients are. The company -- which also has partnerships with Weight Watchers and celebrity chefs -- lets customers purchase individual meals, you don't have to buy a subscription. Chef'd and the New York Times declined to comment on specifics about the revenue structure of the partnership. The partnership is slated to go live early this summer. Just "a handful" of the New York Times' more than 17,000 recipes will be available to start. The service will be available in all 48 continential U.S. states. The hope is that down the line, the service will be directly available on NYT Cooking, a site and app that the Times launched in 2014. The news comes just two days after grocery delivery startup Instacart announced a partnership with startup PlateJoy, a nutritional assistant app. PlateJoy provides food recommendations, recipes and meal plans, while Instacart takes care of the food delivery.